Monmouth County personal injury lawyer, What Happens to the Defendant? Any knowledgeable Monmouth County personal injury lawyer can tell you that after you have been involved in an accident that has resulted in injuries to yourself or others in your vehicle, the insurance company will proceed to contact the person, persons, or company that you believe was responsible for those injuries. At that time, it is likely that statements and reports were given by either the person or persons who caused your injuries (or a company representative if it was a company that caused your injuries) to the claims adjuster who was assigned to handle the claim. In all probability, those statements and reports were recorded and written transcripts were made of those statements. Once the insurance company has done its preliminary investigation of the accident, there typically is little to no contact between it and the person, persons, or company who caused your injury. Simply put, the insurance company generally does not keep the insured informed on the day-to-day development of the case, except in cases of medical malpractice. Hence, the person, persons, or company who caused your injuries will probably go on, continuing on with his or her normal routines and life, hoping that the case will get settled by the insurance company without him or her having to be involved any further. However, if no settlement can be reached between you, your attorney, and the insurance company, the case will be litigated. At that time, the insurance carrier will reach out to the insured once again. An attorney for the insurance company will be assigned to represent the person, persons, or company who you allege to have caused your injuries. The insured will have to participate in the litigation process and will be made to assist the assigned attorney. It is imperative that you remember that if a lawsuit is needed, it will be brought against the person, persons, or company involved and not against the insurance carrier itself, even though the insurance carrier will most likely be the one that pays the settlement or verdict. 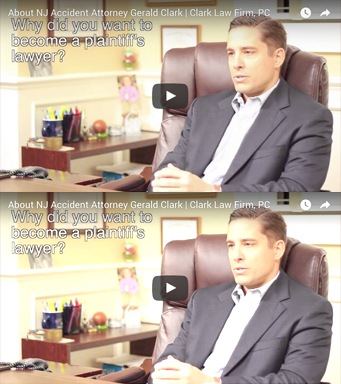 If you need a qualified Monmouth County personal injury lawyer, please do not hesitate to call the Clark Law Firm for an initial consultation.